Somebody was going to have to pay! After the humiliations of last week, when Whitley Hall and Treeton both lost badly, the knives were being sharpened in Ecclesfield and the tumbrils were trundling expectantly down Washfield Lane. The terrace at Treeton murmured with pleasure as Steve Foster, absent last week, returned to take 7-28 as Tickhill (who’d presumed to move above them in the table) were bowled out for 57. 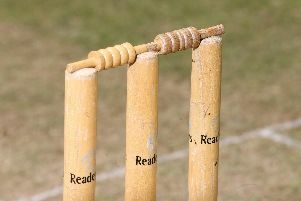 Like Whitley, Treeton won by eight wickets, needing only 12 overs. So equilibrium was restored. Aston Hall took advantage of Tickhill’s demise to replace them in the top three, beating Houghton Main. Uzman Azeem scored 70 as Aston made 221. Rob Jones took 4-39 and Liam Rigby made 77 for Houghton but, even with the extra overs Aston had donated, they could only manage 194-9. Steve Ludlam and Nick Smit did the damage with four wickets apiece. Elsecar, who wept for the early part of the season, are now in full cry, and they easily rode down Conisbrough. Wickersley, not quite so consistent, had a better day, bowling out Darfield for 165 (Peter Hadfield 66, Haider Jahangir 5-36) to win by five wickets, with everyone contributing. And Coal Aston continued to haul themselves away from the bottom, Liam Johnson pulling hardest with 142*, carrying his bat in 253-6 before sharing in the wickets as Hallam started and finished boldly but ultimately succumbed for 187 (Nick Dymock 54, Jonathan Bosch 4-25). The two Nicholas Associates’ Mick Savage Trophy semi finals were played on Sunday. Whiston, powering away at the top of Division One, predictably beat Upper Haugh of Division Two, but not without a little ruffle. Upper Haugh made 170, Matthew Edmondson top-scoring with 40, and Whiston, who have regularly been making 300 or more, were 126-5 at one stage, with Andy Tomlinson and Danny Kemp both gone for low-ish scores. But Alex Galloway and Peter Wilson steered them home without further loss. In the other semi-final, Rockingham, of Division One, beat Hallam 2nds of Division Two, mainly thanks to 120 (out of 239-8) from Robin Singh. Mathew Kurian took 5-28 as Rockingham lost six wickets for 40 at the end, but despite another solid 50 from Matt Davis, Hallam could only manage 157, Jordan Hanson taking 4-23. So Whiston and Rockingham will contend the final at Darfield on August 2. Also on Sunday, in the Nicholas Associates’ Whitworth Cup semi final, Whitley Hall continued their return to form, restricting Wickersley to 185-8 (Shaajhan Younis 70, Tom Fletcher 3-27), then storming past them in 34 overs for three down, thanks to Neil Longhurst (76) and Wilson (65), with his second half century of the weekend. So the final will be between Whitley Hall and Treeton, the two mightiest sides in the South Yorkshire League Championship at Northfield Lane, Wickersley, on Sunday, July 26. Try to get there if you can. It should be a fantastic game.